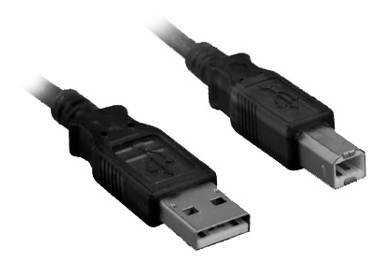 This cable is a type A male to type B male USB 2.0 peripheral cable rated up to 480Mbps. It is used to connect your USB 2.0 peripheral (printer, scanner etc) that is equipped with a type B female connector to your host computer or USB 2.0 hub. It will also work with all USB 1.1 applications..
Universal Serial Bus (USB) is a serial bus standard to interface devices. A major component in the legacy-free PC, USB was designed to allow peripherals to be connected using a single standardised interface socket, to improve plug-and-play capabilities by allowing devices to be connected and disconnected without rebooting the computer, and to allow specific classes of hardware to be used without requiring individual device drivers to be installed. USB is intended to help retire all legacy serial and parallel ports. USB can connect computer peripherals such as mouse devices, keyboards, PDAs, gamepads and joysticks, scanners, digital cameras and printers. For many devices such as scanners and digital cameras, USB has become the standard connection method. USB is also used extensively to connect non-networked printers; USB simplifies connecting several printers to one computer. USB was originally designed for personal computers, but it has become commonplace on other devices such as PDA's and video game consoles. Note: the total distance for a USB cable (or two USB cables joined) must not exceed 5m. After this distance an Active Extension cable or a USB over CAT5e solution must be used.